Zucchini is not the favorite vegetable on the table because of its fresh taste. 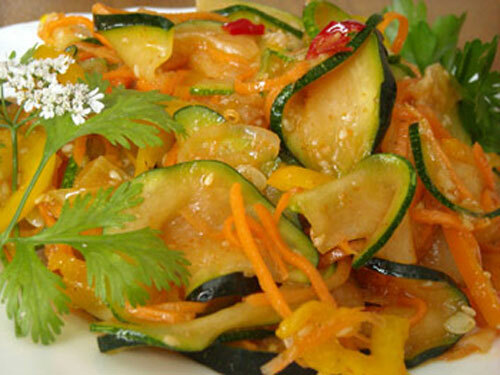 But this can easily be corrected if in a dish of zucchini add ingredients commonly used in Korean cuisine. And who can't eat too spicy, can reduce recommended recipe amount of pepper and vinegar. Recipe pickled zucchini I am glad that it is possible to use overgrown vegetables. Of course, the young fruit is always better, but if they're stale in the garden, it is also suitable for this salad. When on the surface of young zucchini, no damage or irregularities, they can not be cleaned. The old tavern should be freed from peel and seeds. Now it needs to be cut into a thin plate – half rings or quarters (if zucchini is too large in diameter). The thinner will be able to cut, all the better: 1.5–2 mm. Chopped zucchini folded in a pot of appropriate volume and filled with cold water. Cooking the vegetables is not necessary, but the water from the zucchini on low heat need to bring to the boil. This process is not fast, so until you can move on to cutting other vegetables. In butter fried onions, roughly chopped. Once the onions are slightly browned, it is added to the carrots chopped by thin straws. This can be done manually, but easier on a special grater. Preferably carrots not to bring to full readiness, because under the influence of vinegar she later softens. Perhaps, for frying onions and carrots zucchini has begun to boil. Then the pan should disable and discard them in a colander to completely drain the water. Roasting vegetables is ongoing, and the next one bell pepper that can be cut as half-rings and strips. Time extinguishing it along with vegetables 5-7 minutes. Now we need to salt and spice. The course is chopped with a knife or chesnokodavku garlic, pepper, soy sauce (2 tbsp), vinegar (1 tbsp). All mixed and ready for another 2 minutes. This is the marinade for zucchini, pre-preparation in boiling water. Now we need to connect them and mix thoroughly. The thinner the zucchini is sliced, the faster they will become impregnated with the marinade. It is better to cook this salad in the evening to cover it with a lid and removing to the fridge to get to sleep. The day is very difficult to withstand the delicious aroma that emanates from this dish. Especially ready to eat pickled zucchini will only in 8-10 hours. This recipe does not involve throwing a zucchini in banks, but in the refrigerator the salad can be stored for more than a week. As a rule, long-term storage is not needed, as the salad is eaten in a few days.